In space, you can't be wasteful. Every bit of extra weight needs to be lifted up. That entails paper, tools and even food and water. Almost the opposite seems to be happening at tradeshows. I recently did some cleaning up of my office at work. Among the items I got rid of were about 2 lbs of flyers, magazines and CDs I got at a couple of trade shows I went to as a part of my job. In software engineering things move (note I didn't say progress...) very fast, and what describes the latest and greatest component or contains a demo of a new release soon becomes stale and outdated. So here's a simple idea I hope Microsoft, Google or any other company would pick up - the paperless tradeshow. It's a tradeshow without any paper (or any other write-once, read-many media such as CDs or DVDs). Oh, but we love the shiny brochures you say? What do you do with them when you get back from the tradeshow? What do you ever use them for if not as links to online resources? I'm sure you can live without those colorful paper airplanes and find something else to use as a coaster. What would be the experience attending a paperless tradeshow? You come to the registration desk. After identification, the lovely receptionist gives you a USB flash drive if you want one or you can bring your own. At every booth there will be a USB hub. Not your regular 4-port, but 10, 20, or even 49 ports, waiting for you to stick the USB drive and get whatever materials you would otherwise get on a piece of paper or optical media. Alternatively, you could use your cell phone to scan QR-codes and essentially get a link to the same information to be retrieved later. QR-codes are two-dimensional barcodes that contain up to 4,296 characters and are currently used to read URLs off of magazines and billboards, exchange Blackberry contacts, etc. At the end of the tradeshow, you don't need to think about the extra weight you have with you and a few months later nothing will get to a landfill. Moreover, the USB drive you may have gotten at the tradeshow could be used for even more green activities - once the information gets transfered to your computer, you can use the USB drive to replace CDs you would otherwise burn (for example, with the ever changing Ubuntu or beta from Microsoft), saving more CDs from getting into landfills. Here's an example, for people who like numbers... Let's look at Oracle OpenWorld 2009 (one of the bigger computer industry tradeshows). According to the Oracle Media Welcome Kit, there were 37,000 attendees and 400 partner exhibits. If each attendee takes materials (1 sheet of paper and 1 CD for the sake of the example) from 5% of the partner exhibits, the total waste of paper and CDs compared to the paperless option would be 740,000 CDs and flyers that will undoubtedly find their way to somewhere far from the eye (and thus from the heart) on Earth. I'm being conservative - I got more from smaller tradeshows. 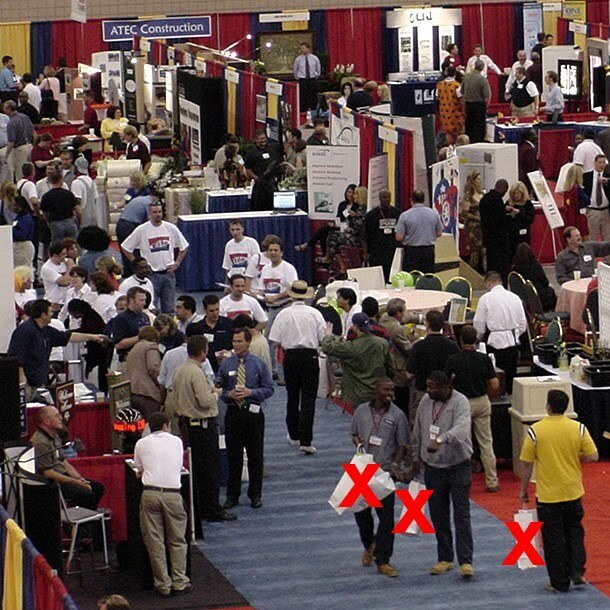 According to the BizTradeShow web site, the number of computer and IT related tradeshows in the next year is 168. Let's assume the average tradeshow is much smaller than Oracles' - 3000 attendees. The same number of CDs and printed paper per capita brings the count to over 10,000,000. I wouldn't be surprised if the total number of thrown-away CDs and printed materials over all industries exceeded a billion every year. How would Steve Jobs put it into words? "Billion! With a B!". 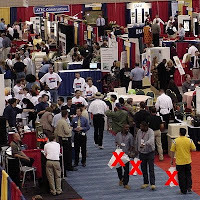 Sure, some tradeshows are going virtual, but some would argue that a completely virtual show is not adequate for every industry, and strips a lot of the human aspects of tradeshows - networking, for example. Paper and CD recycling also exist, but why invest even more money and energy to transport, convert and reuse the CDs if there's an alternative? Remember - over a billion CDs and printed materials get handed out in tradeshows, the content of which becomes stale after a short time. The paperless (and CD-less) trandshow would maintain the human interaction aspects of a tradeshow while avoiding all that waste. Microsoft? Oracle? Google? ... Bueller? Great idea, but I think spreading viruses or malware could be a major issue. I wonder if doing it wirelessly with, say, bluetooth would be better. Hi, i'm part of a computer project (haiku-os.org) and have started a discussion about exactly that problem on the project's mailing list. Glad i'm not the only one concerned by the problem. 2 - the show gives one (formated) sheet of paper per attendant. Each booth writes url(s) on it. (might use a kind of stamp). With all the smart phones people have nowadays, combined with how cheap USB drives are, it shouldn't be a problem to keep it completely electronic. It will also scale better than booth presenters writing anything.